This Bok Tower Gardens Florida Wedding encompasses a big reason why we love to travel to the Orange State. There are both the deep greens and Spanish moss hanging from the rafters. Once you get through the garden maze you reach the sanctuary Tower. Nikki and Billy had such a wonderful time wandering around the grounds admiring all it had to offer. All the while looking just as amazing themselves to fit right in with this Florida landmark. You can see more from this shoot in our PORTFOLIO. Kalien and Kevin had one of the more romantic weddings we have seen and the amazing Fess Parker Wine Country Inn Wedding. Not only is it tucked away in the beautiful hills of Los Olivos, but it is only minutes from a romantic outing at their very out vineyard escape. We had the wonderful opportunity to sneak away from the cocktail hour to the hidden vineyards on the hill that most of the general public visiting does not have access to. Getting to see the sun shine though the oaktrees that guard the fresh grapes is truly spectacular. If you are not enjoying the wine and horses, you must definitely be indulging in Chef John’s amazing cornbread during a Fess Parker Wine Country Inn Wedding. The Bear and Star is where John is cooking up something delicious and fresh from their farm for you to enjoy. The garden is full of wonderful produce that guarantees a fresh tasty treat for you and all your guests. We got to see this bride and groom enjoy all of that and more with their intimate wedding of close family and friends. The sun is shinning, the flowers are blooming, and love is in the air, which can only mean one thing; spring is here and that was definitely apparent at this Calamigos Ranch Spring Wedding. You can’t have spring without flowers and this wedding delivered beautiful florals done by Coco Rose Design and design by Vanessa Noel Events. Just take a look at the gorgeous white garden roses accented with green foliage through out the wedding. The classic design is perfect from the bride’s bouquet, the boutonnieres, the center pieces, even the giant arrangements that covered the ceremony arch. You also can’t have spring without love and we enjoyed capturing the sweet moments between these two. Seeing Tyler in her stunning dress and RJ in his dark grey suit, share sweet smiles and laughs with one another was a great way to kick off the spring wedding season. Those tender moments between these two that they will be able to cherish forever warms our hearts to be a part of. The Redwood Room is so spectacular for an amazing ceremony arch. If you are looking to look like you are in the middle of the forest, check out our blog post of the Birchwood Room at Calamigos Ranch. This Las Vegas Country Club Wedding was full of love, friends, family, fun, and you can’t forget the beautiful backdrop of the Vegas strip. It was definitely a wonderful and unique scene that made this wedding extra special. As much as we love our Southern California weddings, it is always a fun experience for us to shoot somewhere different, especially when our bride and groom have fallen head or heels for their wedding venue. At the Las Vegas Country Club Wedding Danielle and Chris wanted to make sure their guest were entertained in true Vegas fashion with a surprise dance performance by professional dancers to the song Despetico, as well as a dance performance by the bride herself with her backup dancer bridesmaids. Although this wedding was full of an array of brightly colored florals from the center pieces to bridesmaids bouquets as you can see Danielle wanted to make sure she stood out on her big day and boy did she with the gorgeous ball gown and all white bouquet. We absolutely love how these bright and boldly color flowers pop on their black invitations. It’s not everyday that you come across black invitations, so we definitely had to give them center of attention in this photo. We all know how brides love to accessorize, but we can’t forget about the groom. Check out Chris sporting this awesome watch for his big day. Such a sweet moment that was shared between the bride and her bridesmaids after seeing their beloved friend in her dress for the first time. This was such a great idea Danielle had to keep her dress a surprise from her bridesmaid until the big day. It was is much fun the be able to be apart of the awesome moment to capture it all. Their faces were priceless. The beautiful color scheme of greens and whites went along perfectly with this Calamigos Ranch Malibu Wedding. The venue was surround with trees that had lights that draped from their branches. 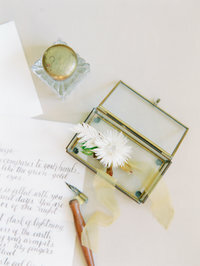 The couple put lots of love and attention in all the details of their wedding from the invitations, that were provided by minted, to the personalized hockey puck groomsmen gifts. Not to mention the guest got to take home their very own potted plants. 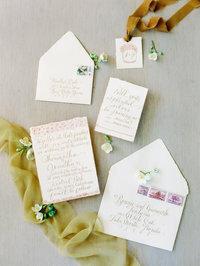 Brenna and Cary truly thought of everything, which made all the details of their wedding have a cohesive look. This Calamigos Ranch Malibu Wedding was filled with lots love. Typically a bride and groom do not see each other on their wedding day until they meet at the alter. However, unlike most couples, Brenna and Cary spent most of their wedding day together. Once Brenna was in her dress, Cary had to wait until his new father-in-law walked her down the isle. Cary was finishing up the seat chart cards while sitting next to his beautiful bride as she got her makeup done. We loved being able to capture all the wonderful memories of this couple as they went through their wedding day together. Perfect color palettes and amazing light make for such perfect memories. For instance, the picture below, which is one of our favorite shots ever! Being the film nerds we are, we loved that our couple provided their guest with a instax film camera to take photos of themselves for their guest book. It’s such a unique touch to be able to have pictures of your guest instead just their names. Can you say wow! Is this wedding cake not incredible. It is definitely not your typical run of the mill wedding cake. This is what we mean when Brenna and Cary put a lot of love and attention into the details of their wedding. The design on the cake seamlessly matches their innovations perfectly. It also adds a unique feel and look with the blue and green rock candy geode.